A wing of the Night Palace is given over to the courts of the Palace of Justice. There are fourteen courts in all, catering to different types of crimes. 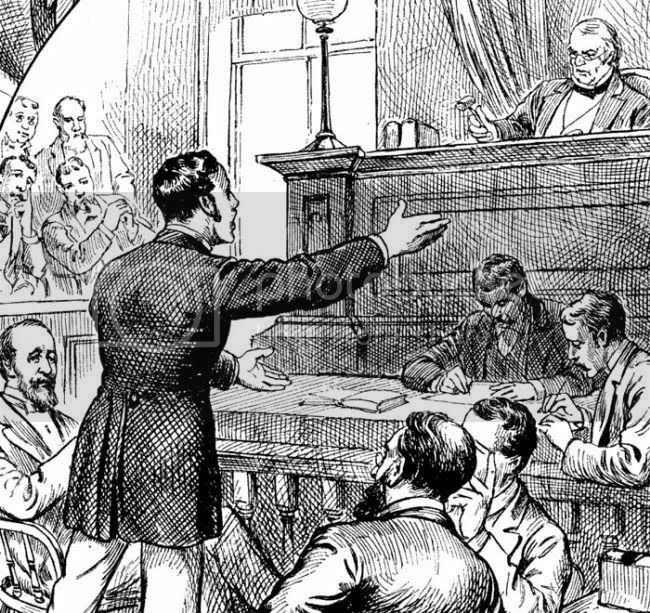 The trial as a form of entertainment is taken very seriously by the judges of the city. As a result, the courts viewing galleries are always packed full. Minor cases of theft and burglary are stretched out to days of outrageous and flamboyant posturing and debate. In many cases the accused hardly seems to be a part of the process, although since they are usually sentenced to death (to the great amusement of the audience) it is a moot point. Although death by disease or assault is an everyday horror of the city, its residents still take great delight in the sentencing and subsequent death of many of the people who pass through the justice system. Thirty judges preside over the courts, with the most popular of them getting the worst, crowd inducing crimes. Barnaby Ruttage, human - A morbidly obese judge, known for eating almost continuously through his trials. In a given day he consumes three roast chickens or other fowl, a dozen hard boiled eggs, two loaves of bread, five bottles of wine, a leg of lamb and a small mountain of potatoes. As a young dandy, he was spat on by a passing labourer and always passes a guilty verdict for any crimes of commoners against someone of better social standing. Eriane Whitepillar, elf - A mage of no small talent, Eriane long ago created a simaculum to cover her court duties. Her creation has degraded with age however, and is making stranger decisions every day. Last week she let off a young woman accused of murder despite eye witness accounts of the crime. The previous week she decreed that a kobold caught stealing must spend the rest of his life walking on stilts, as a loftier view should 'bring new perspective' to his life. If the simalacrum keeps this up, she may lose the respect of the mob and be removed. Droll, Mallowney, human - At 6'4, but unhealthily thin, Droll appears more skeletal than alive. He treats his duties as an entertainer of the people very seriously, and has been known to rant for days at an accused. Thought to have never married, he actually has a wife and three children at home, locked in their rooms and forbidden to leave. Although they one day hope to escape, this is increasingly unlikely as Droll has ordered chef to add increasing amounts of laudanum to their dinners. If anyone ever discovered these unwilling occupants, he would claim that his wife is an evil spirit and the children her spawn. He could probably get away with that, but if overly pressed, he would simply end his life to avoid any embarrassment. Creatine Gnoss, human - A hard woman, all angles and hard lines. She delights in sending kobolds to their death, considering the 'creatures' to be base and unclean creatures. She has a large compound out in the swamp with almost a hundred kobold slaves that she tortures regularly. If this was ever discovered, she would undoubtedly be lynched by a mob of not only kobolds, but humans, orcs, elves and dwarves. Holin Ironbrand, elf - One of the fairer judges in the city, he nevertheless, holds a grudge against other elves of the Ironbrand. Almost 50 years ago, before many elves came here, he was driven from his family for consorting with an orc (who has since died after a long and happy union). Exiled, they wandered the worlds for a while before coming to the city. Myrian DeLynn, human - DeLynn cultivates an open hatred of elves and elvenkind. In court, she sits on a throne of elven skulls. She advocates genocide and a swift violent purge of those with elvish blood. She has survived six assassination in as many years and today, she lives in a suite of rooms in the courts to avoid further attempts on her life. When she does travel, it is in a coach with no fewer than 10 guards.